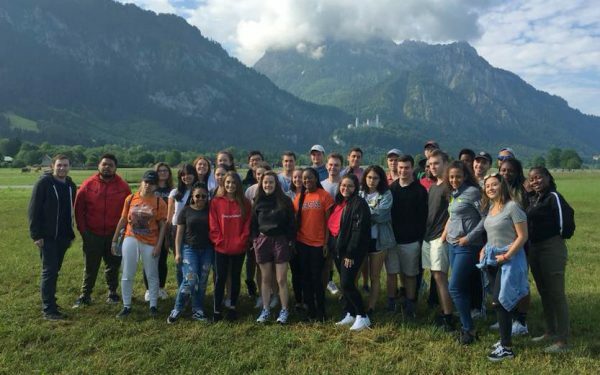 Students on the 2018 EuroTech trip pose for a group photo near Neuschwanstein Castle in Bavaria, Germany. Fall information sessions for the 2019 AsiaTech and EuroTech Immersion Experience trips hosted by the School of Information Studies (iSchool) have been scheduled. These three-credit traveling seminars expose students to some of the largest global corporations so they can see first hand how these institutions use information to address global technology challenges. Participants will get an inside view of the top global corporations across Europe or Asia while visiting historical and cultural highlights along the way. Students will also have free time to explore each city on their own, as well as visit cultural attractions as a group. The trips are open to students from all SU schools and colleges. The 17-day AsiaTech trip runs from mid-May through early June 2019 and will take students to Hong Kong, Malaysia, Singapore and Thailand. More details are available on the AsiaTech webpage. The EuroTech trip is a 17-day seminar that runs from the end of July through mid-August 2019 with visits to Amsterdam, Bruges, Brussels, Geneva, London, Lyon, Munich, Paris, Rome and Venice. The EuroTech webpage has additional information about the trip. Applications for the programs are due Oct. 15. Questions can be directed to Kathy Allen, assistant dean of student and career services at the iSchool.